While members of the Bar benefit from local court programs that may assign mediators, often serving as volunteers, advocates and their clients often have cases that merit more control over the mediation process. In such cases, the parties may elect to choose their mediator. Subject Matter: Do you want an expert, or an expert mediator? While many parties initially seek a mediator with expertise in the subject matter of the mediation, they often learn that there may be more value in a mediator who possesses highly developed mediation skills. This is a balance which each advocate and client should consider carefully. Mediation skills require experience and time to develop. A skilled mediator is usually a "quick study" of subject matter who is able to learn enough from pre-mediation statements to be able to understand the nomenclature and converse in the subject matter. Many advocates agree that, while subject matter expertise may not be essential for a mediator, some familiarity with the issues tends to lend efficiency to the process. References: Are you getting the real picture? Most advocates ask potential mediators for a list of references. The mediator typically provides names of counsel for whom the mediation process worked well and who will be most likely to provide positive references. An alternative is to ask the mediator for the names of the counsel who participated in the mediator's last five mediations. You will learn not only whether some counsel had negative experiences with the mediator, but also, by looking at the length of time the cases span, be able to determine how active the mediator's practice really is. Training: Is your mediator a trainee or a trainer? Since there are few official standards for mediators, a mediator may have been trained for as few as two days. A course of even five days may not be sufficient to develop effective mediation skills. When interviewing a professional mediator, it is often useful to ask not only about the training they received, but also how much training they conduct. The challenge of teaching is often a greater learning experience than training received. Philosophy: Facilitative, Evaluative or Transformative? Does your prospective mediator believe that the "playing field" needs to be leveled by asking parties to share information that one party might otherwise prefer be kept confidential, such as alternative case theories or case law which may help one party? Does your mediator believe that it is constructive to share their opinion? Do they understand what happens after their opinion has been shared? Has your mediator been trained in transformative mediation, a process that attempts to strengthen parties' relationships, or in facilitative mediation, where the mediator serves as a catalyst to the negotiation process? Credibility: Mediators don't settle cases, parties do. A mediator's ability to quickly establish credibility with a wide variety of parties is critical. Experience and early research seem to indicate that the only reliable preliminary indicator of the success of mediation is the parties' judgment early in the mediation process as to the mediator's capability. Do prior counsel report that the mediator was able to establish credibility with the parties early in the process? Was the mediator able to handle difficult clients - even where attorney-client relationships had eroded? Remember: while many mediators take credit for resolving cases - i.e. their "settlement rate" - mediators don't settle cases, parties do. If your prospective mediator is promoting their settlement rate, might they not have established a personal interest in the outcome of your case? Confidentiality: Do they quash subpoenas? To what extend does the mediator protect confidentiality? What will your mediator do if subpoenaed by your client, your client's next attorney, or the other side? Have they had experience with these issues? Will the mediator breach confidentiality where they feel they have a moral or ethical obligation to do so? Will they reveal to you in advance what those thresholds are? Will they furnish you with all ethical codes to which they subscribe? What will they do when their ethical code conflicts with their ethical obligations as an attorney? Cost: What if there is no mediation? What are the mediator's policies for cancellation? What if only one party cancels? What if the mediator terminates mediation - will the parties still pay? 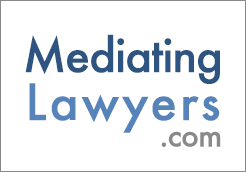 Does the mediator offer daily as well as hourly rates? Does the mediator charge for preparation or travel time? Lawyers and firms who have received training in mediation advocacy are able to offer clients additional expertise as settlement counsel in ADR (Alternative Dispute Resolution) processes. They develop not only litigation strategies, but also case resolution strategies, which include a rigorous process for interviewing mediators. Jerry Roscoe serves as a mediator and arbitrator with JAMS, The Resolution Experts, the nation’s largest private provider of mediation and arbitration services. Mr. Roscoe has successfully mediated and arbitrated the following representative matters.